By all accounts the Chavarria family's 1-year-old dog, Jax, is a "happy, go lucky" dog, as they say. That is -- until last week. "We noticed he wasn't eating, he was just really lethargic, he was coughing a lot," said Jax's owner, Gauria Chavarria. Turns out it was not just the cold weather. One vet told the family Jax had "kennel cough," a contagious respiratory infection. 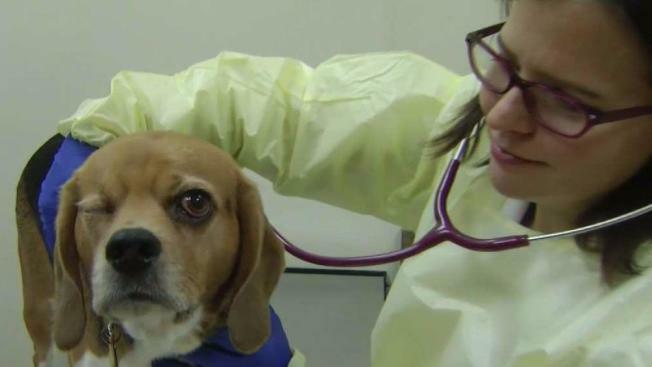 But after a trip to a San Jose animal emergency hospital and nearly $2,000 later, Jax tested positive for canine influenza, also known as the dog flu. He then started antibiotics. "I didn't know a dog could get the flu," Chavarria said. Dr. Stephanie La Plume with United Veterinary Specialty and Emergency said dog flu is "highly contagious," and the pets can catch it most where dogs interact with other dogs -- like dog parks, kennels or doggy day cares. The Chavarria family tells us Jax started coughing, losing his appetite and being lethargic after they brought him more from "We Dog Care" doggy daycare in Willow Glen. A second dog owner whose pet was also diagnosed with the flu at the same emergency room hospital has a similar story. "I've been here at this hospital for 10 years. I've ever seen canine influenza before and now, in the past week, we've had two cases hospitalized with it and a dramatic increase in dog's coughing," La Plume said. A manager at We Dog Care said during the course of last weekend, the daycare started to see possible signs of kennel cough. By Monday, the manager said they had confirmed cases. It is unclear whether or not the two confirmed dog flu cases at the emergency room clinic started from We Dog Care. The facility said either way, it is closing down on Sunday for deep cleaning and renovations. "All dogs at We Dog Care have received the bordatella vaccine and we use industry best practice cleaning solution to minimize germ spread. Staff is trained to identify kennel cough and other sicknesses and we turn away dogs showing up with symptoms. If dogs develop symptoms in our care we isolate them immediately. All customers have been made aware of these policies from the time they sign up as it is included in signed agreements and lobby literature. Nevertheless, like the human cold, there is no way to eliminate the spread of the dog cold and flu in a social environment altogether. There is an incubation period and some dogs can be carriers while showing no symptoms. We have worked with local vets to contain and minimize this outbreak." If your dog develops a cough, La Plume encourages owners to call a veterinarian immediately because whether it's kennel cough or the flu, your pet should not be around other dogs so the virus does not spread. Meanwhile, Jax appears to be on the road to recovery. "He's still coughing a little bit, but he's actually getting his energy back, which is good," Chavarria said.